The D3-HB-MVP from Dotworkz is a D3 Heater Blower Camera Enclosure With Multi Volt Platform (Mvp) And Vandal Tough Clear Lens.The Dotworkz D3 environmental housing sets the industry standard for design excellence in camera protection from the rigors of outdoor use, vandalism and physical damage. To offer this superior performance in a cost-effective, all-weather package, Dotworkz has incorporated its proven Heater/Blower system into the D3 architecture. 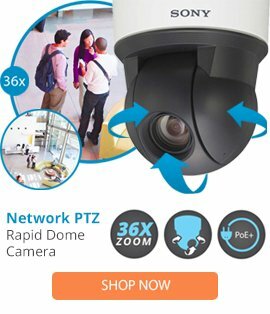 It is ideal in weather conditions ranging from 30° F (-1° C) to 95° F (35° C), where it will maintain PTZ cameras at optimal operating temperature. Excessive cold and heat could potentially damage sensitive IP and analog cameras. To combat the cold, the unit€™s heater automatically activates at 40° F (4° C) and deactivates at 60° F (15° C) with a thermal cut-off assuring safe heating operation. The blower remains on at all time, keeping cameras cool and fog free. The Heater-Blower D3 system is expandable to our dual blower Tornado system. The ultimate barrier between the camera and environmental factors, the Heater-Blower D3 significantly reduces weather-related wear-andtear. It is tested to be water, dust and air tight. For the most extreme climates, Dotworkz suggests the D3 equipped with either the COOLDOME„¢ module designed for use where temperatures above 105° F (66° C) or the Ring of Fire„¢ module that will prevent cameras from freezing in climates down to -40° F (-40° C).